Before you book a flight you can use Utiket to find the cheapest flights to Da Nang for Vietnam Airlines (VN), VietJet Air (VD), VietJet Air (VJ), Singapore Airlines (SQ), Cathay Pacific (CX), Korean Air (KE). All flight data are real-time and accurate. 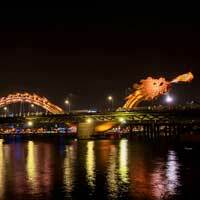 Follow the links to search and book your cheap ticket to Da Nang directly with the airline or one of our partnering travel agents.